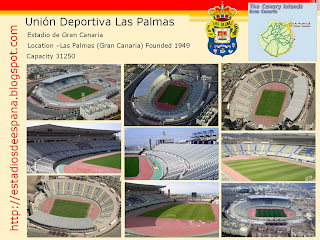 The return after a 12 year absence of UD Las Palmas to La Primera brought about much renewed hope and optimism. It also brought with it the development by the municipality of a new stadium to the south of the city. The club had spent over fifty seasons at their beloved Estadio Insular, but even their most loyal supporters would agree that the old stadium was antiquated and past its use by date. 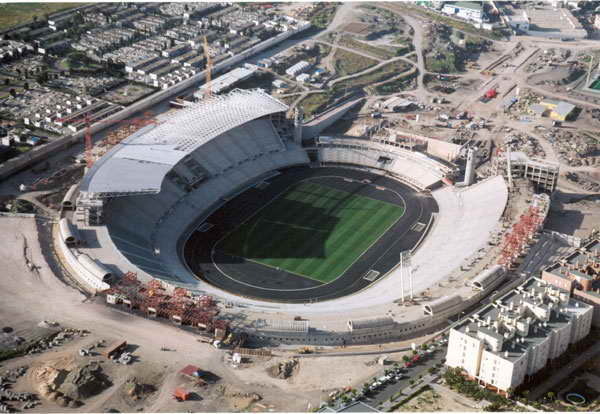 However, the new 50 million euro development did not meet with much approval from the club's supporters. Designed by Pedro Medina, the municipality's brief of a multi-sports and leisure development was followed to the nth degree and what was delivered was about as far away from the old Insular as one could possibly get. Now followers of this website will know that I am not a big fan of stadiums that feature an athletics track. They are often featureless bowls that lack atmosphere and ultimately ruin the match day experience. 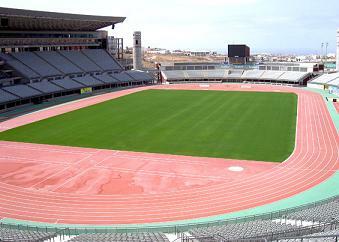 But boy, the Estadio Gran Canaria takes this to a new level. Almost universally disliked by any follower of the club, it opened in 8 May 2003 with a friendly match against Anderlect, which Las Palmas won 2-1. There was a problem however that had nothing to do with the stadium's design. Las Palmas was no longer in the top flight and there was no hope of filling the 31,000 seats at the new arena. 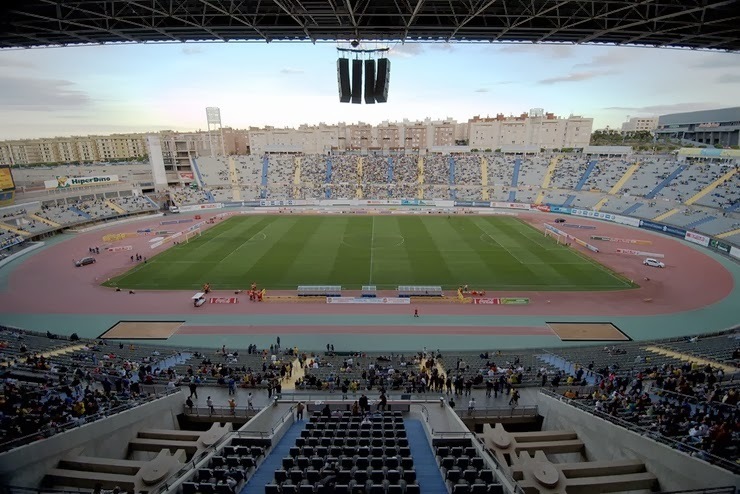 Worse was to follow, as in their first full season at the Estadio Gran Canaria, the club finished twentieth in La Segunda and was relegated to the regionalised third tier. With debts of over 60 million euros, the club was saved in part by new bankruptcy laws and new club president Miguel Angel Ramirez. 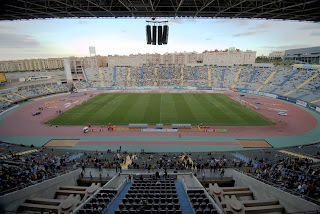 It took two seasons to escape Segunda 2b and in the final of the 2005-06 play-off a record attendance of 30,210 watched Las Palmas beat CD Linares 1-0 to clinch promotion back to La Segunda. The club's form since returning to the second flight is consistent, in that it has successfully battled against relegation in four of the past five seasons. Only an eighth place finish in 2007-08 has lightened the mood. This season, backed with a good group of players from the clubs academy, hopes have been set a little higher and the club has made a decent start. What is there to describe about the Estadio Gran Canaria? Well, it is big and grey and rather unloved. So much so that the club is seriously considering a move back to a redeveloped Insular. This has prompted the local municipality to spring into action with a 25 million euro plan to remove the athletics track, lower the pitch and increase the capacity to 40,000. All of this will come out in the wash and in the meantime, Las Palmas play in front of average crowds of 14,000, who are lost in this cavernous bowl. Unlike other large stadiums with tracks, the whole of the stadium is open on match days with the club's most passionate supporters opting for the smaller north terrace. The rest of the stadium is made up of a large single tier of grey seats that sweep around from east to west. The west side has three levels of hospitality boxes at the rear of the seating and a deep cantilevered roof, the stadiums only redeeming feature, provides almost total cover for the seats below. The Spanish national side has played two matches at the stadium. the first was a friendly in August 2004 against Venezuela, which La Seleccion won 3-2. Then 3 years later in November 2007, Spain beat Northern Ireland by a goal to nil in a Euro 2008 qualifier. Where the national side play on their next visit to the island is still up in the air, but at least there may not be a feckin' athletics track in the way.